While in California I attended a Saturday evening church service at Saddleback Church. This is the church pastored by Rick Warren of the Purpose Driven Life fame and fortune. I was there with a few of my fellow traveling companions and from the time I entered the building and received my bulletin and message outline there was a very familiar feel about it. First the outline was identical to the outlines provided now in a church I attended for nine years and have since left. The music was pretty good, but the people seemed a bit detached and passive. The message title told me they were in the middle of a series about your worldview. The message was delivered by the man himself, Rick Warren. He looked to have lost some weight from previous pictures I had seen and he was sporting a gotee. The message was going along fine if not but a bit superficial until he said that God made us because He loved us and so we could love Him. (God created us to His glory) Also in relation to God breathing the universe into existence Warren said that it didn’t matter if you believed it took a week or a million years. (I believe in the literal 6 days of creation) He then used the passage in 2 Peter 3:8 out of context to affirm his vagueness with creation that with God one day is like a thousand years and a thousand years is like one day. Peter is writing this to encourage his readers that God is not slow about His promise. Warren used so many more passages out of context to prove his outline points. The whole underlying theme of the message was you and me centered, it made me sad. It was definitely seeker sensitive and not Christ sensitive. He does not preach about the sovereignty of God by his statements of “God is in the business of turning crucifixions into resurrections”, and that “abortion short circuits God’s plan.” He compared God to Macgyver the TV show because He makes something useful out of odd pieces. The whole experience lef tme feeling like I had been to therapy and not a worship service. How are his members going to learn about the God of Abraham, the God of the New Testament, about Christ and the cost of following Him with this kind of message. While there I kept praying for God to raise up men who would influence the church to a more Christ centered approach, and I will continue to pray for those there. On a positive note the facilities were very impressive. It was all laid out like a campus with a cafe where you could get coffee (which we did, I don’t think we passed many Starbucks or coffee shop last week) to buildings for training, teaching and a resource for curriculums, and bookstore. It looked like they had much more but I didn’t stray to far. 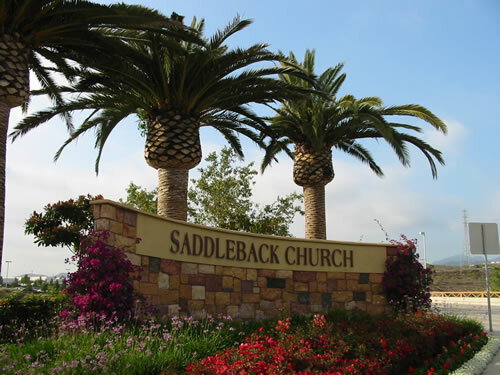 Please pray for Rick Warren and Saddleback Church.